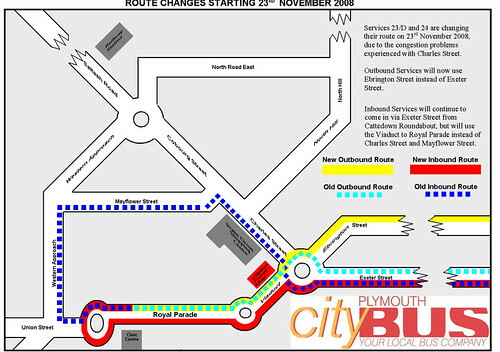 Citybus are changing the route into the City centre for some of their routes as from 23rd November. 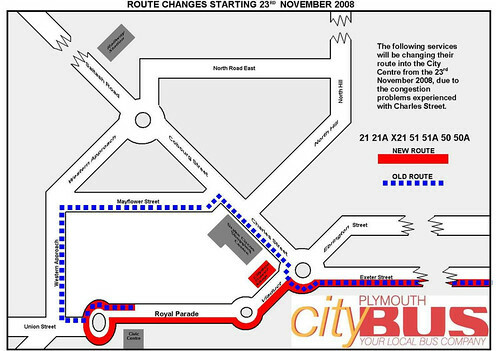 Plymouth Citybus experienced a period of very poor performance during the run up to Christmas 2007. This was caused by traffic congestion at Charles Church and Drake Circus in addition to other locations where congestion was and continues to be problematic including Derriford around the George junction interchange, Prince Rock, the top of Victoria Road at the junction with the A38 slip road, Manadon roundabout, Peverell junctions, Stoke Village and Transit Way. Although Plymouth City Council have made some improvements to Charles Cross roundabout, which has improved the flow of public transport around Charles Church we continue to work closely with the hard working Public Transport team at Plymouth City Council to find solutions to the other congestion areas in the city. We hope that funding will be approved for the Prince Rock road improvements scheme, which if successfully delivered should see a substantial improvement in public transport operations. However, the situation at the junction with Drake Circus and North Hill is now very serious. We continue to experience considerable delays to bus services on approach to the City Centre and on a large number of occasions have diverted services away from Drake Circus. We understand that these changes implemented will cause some inconvenience. 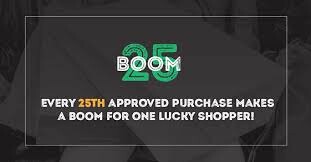 We apologise profusely but believe that if these alterations are not made it will be almost impossible to avoid a repeat of last years poor performance. 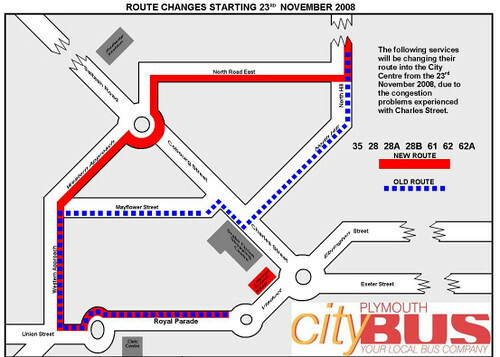 Over the Christmas period Plymouth Citybus will be conducting an extensive analysis to ascertain if our customers would wish the above services to return to the pre November 23rd operations when City Centre congestion levels have eased. 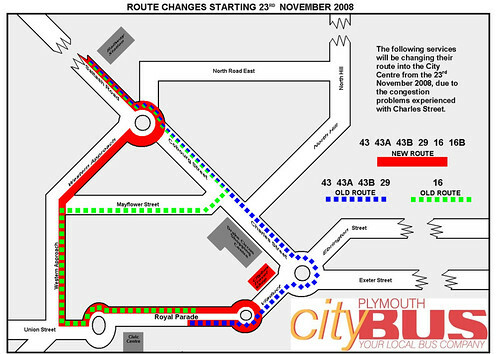 Plymouth Citybus would therefore welcome any comments in respect of the changes. Comments can be sent either by email to peter.oliver@plymouthbus.co.uk, or by post to: Peter Oliver, Commercial Manager, Plymouth Citybus, Milehouse, Plymouth. PL3 4AA. Whilst we will be unable to respond to every letter and email we give a commitment that the comments received during the period of our analysis will be key factors when decisions are reached as to which services will return to pre 23rd November operations once traffic congestion around Drake Circus has been reduced. Once again, Plymouth Citybus apologies for any inconvenience experienced and can only reiterate that these changes are what we feel, to be in the interest of our passengers. We would like to take this opportunity to thank our passengers and will be grateful for your response to our actions. All comments will be used to assist in our route analysis after the holiday period. Service 23/D and Service 24. To change the inbound route of these services from Charles Cross roundabout to operate direct via Exeter Street Viaduct to Royal Parade using Derry’s Cross as the bus turn around point. Charles Cross roundabout and Ebrington Street to Tothill Road as opposed to Exeter Street and Cattedown roundabout to Tothill Road. Service 21/A/X21, Service 51/A/D & Service 50/A. To change the inbound route of these services from Charles Cross roundabout to operate direct via Exeter Street Viaduct to Royal Parade using Derry’s Cross roundabout as the bus turn around point. Service 28/A/B Service 35 Service 61, Service 62/A. To change the inbound route of these services from Mutley Plain to operate from Mutley Plain via North Road East , Western Approach and Union Street to Royal Parade. Inbound services withdrawn from North Hill and Mayflower Street, no changes to outbound services. To change the inbound route of this service from North Cross Roundabout to operate direct via Western Approach and Union Street to Royal Parade. Services 43, Service 43A, Service 43B & Service 29. To change the inbound route of these services from North Cross Roundabout to operate direct via Western Approach and Union Street to Royal Parade. Services withdrawn from Coburg Street, Charles Street and Exeter Street Viaduct. I am very impressed with Citybus for getting this information out in plenty of time and with such a detailed explanation why the changes are being made. Certainly anybody who has been into the City Centre knows the problems with traffic in the Drake Circus area. The maps shown above are being printed and will be displayed in bus stops all across the City which should help save any confusion although I believe that some of these re-routings already happen at times of severe congestion so many passengers will be aware of the routes already. The maps are nice and clear and easy to understand too which is always a bonus. From a personal view point I prefer the new route of the 50 into town as most of the time Bretonside is my first port of call but I am probably not your average passenger! If it works and saves time and helps the buses keep closer to their timetables then it all has to be a good idea. Note that not all Citybus routes are being altered yet, I guess this is just hoping that a reduced number of buses in the area might help the remaining services get through? Avoiding Charles Street at all costs is a good idea, but i'm not sure Citybus have taken into account the hundreds of old dears who sit in the shelters on Mayflower Street, which will also be bypassed now? Expect the letters page in the Herald to explode with angry and outraged pensioners about the new changes, and how the city council has gone to the dogs (again). Understandable change, but this now means I have to walk the length of Mayflower Street to get to work, boo! it does seem rather extreme completley bypassing drake circus,and as mentioned above they will loose out big time with the old dears, they WONT walk anywhere! as we found out on the 14/4, i work for first and yes we get caught up in the traffic, but its not for hours or anything is it? citybus have been bypassing it at peak times already, which i'm sure not all passengers are happy with. about we took them over and showed them how to run a decent service, i say!